Using Essential Oils on the Feet? Using oils on the feet isn't a safety issues unless you are using them undiluted (neat), or using oils which are not safe for your situation. 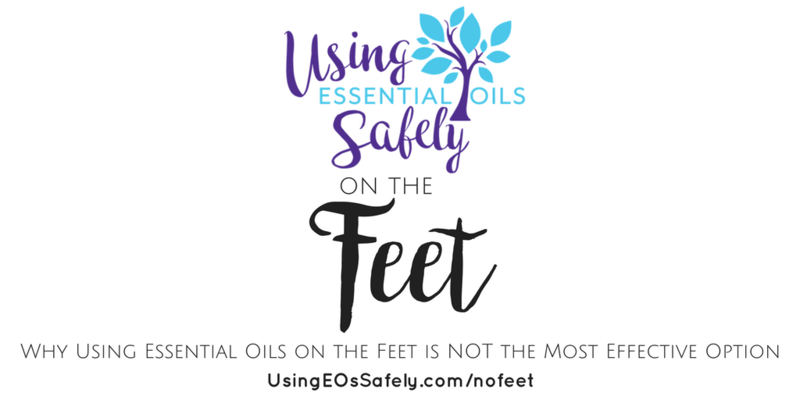 Applying oils to the feet does not make an unsafe oil any safer. There are many other ways to use essential oils which are much more effective and putting oils on the feet is a bit wasteful when there are other places where they will work much more effectively. * Applying oils on the feet is not the most effective use of your oils unless you are having an issue with your feet. * Inhalation is typically the most effective option. * A personal inhaler or a diffuser is a better option. * If you choose to use topically, you may find it more beneficial to apply where the oils can best be smelled. Such as behind the ears and down the neck, or on the upper chest. * If you feel that applying to your feet works, you may find that it works even better to apply to other places where the oils can be better smelled. * The skin on the feet is very thick. * The feet are filled with sweat glands. * Sweat glands are much better at expelling than absorbing. * The feet are a long ways from the nose. Following are some great articles which will help explain this stance even more. Some people will say that oils on the feet work due to reflexology, but here is a quote from the following article.